One of the earliest mainstays of PC gaming has been the space combat/trading game. From Elite on the Commodore 64 back in the 80s to the early 90s Wing Commander epics, Freespace, and countless other lost to time, these games were a big business. Possibly due to the inconceivable success of Wing Commander creator Chris Robert’s Star Citizens, exploring the grand void is back in style. But that juggernaut of virtual space life is far from the only game in town, with the recent release of the gorgeous Elite Dangerous and a shocking amount of indie games taking off into space as well. Among those is probably one of the oddest and most likeable of the bunch yet, Rebel Galaxy. Far from a typical Elite/Wing Commander clone, the game takes its influences from a wide variety of new and old classics. We chatted with Travis Baldree, who is the co-owner and co-developer for the makers of the game, Double Damage Games. Travis and his partner in development, Erich Schaefer, have an impressive pedigree, as they are the masterminds behind the Torchlight games. With that success behind them, they left the comfort of fantasy RPGs to pursue something completely different. Rebel Galaxy, even at its early stages, is already incredibly impressive, especially considering the bulk of the work is being done by just two guys. 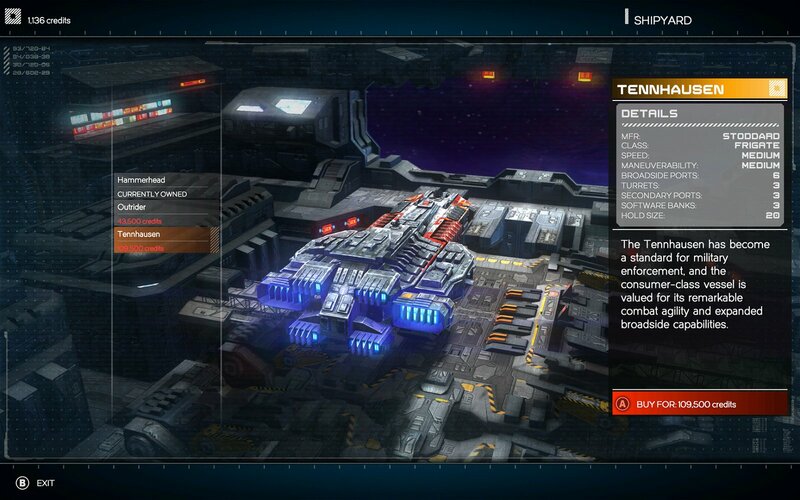 The game itself is a mix of space trading, exploration, conversation, and combat. When the protagonist gets an old space ship and a strange message from a distant aunt to come meet her in a hurry, it sets off a grand and humorous adventure. The aunt, it seems, was something of a smuggler and has gotten herself into trouble. Tracking her down is part of the main storyline and there’s no shortage of story-based missions, but (as with most open world games) it’s all the other things to do that really make things interesting. There are constant streams of randomly generated side missions to partake of. 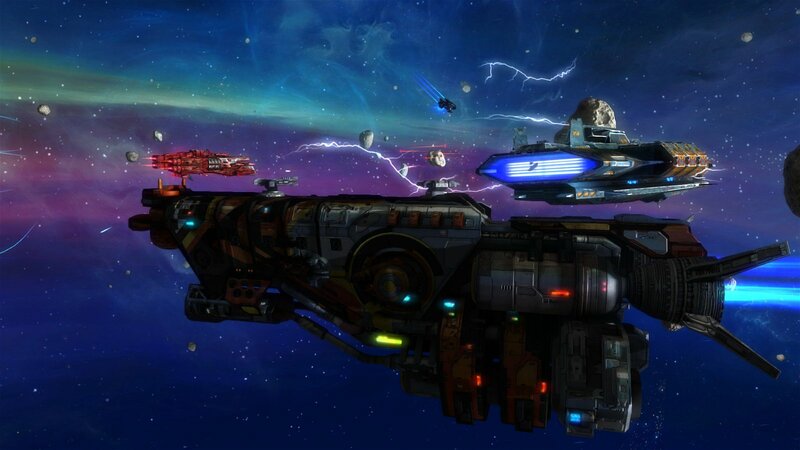 Whether simply buying and selling goods, actively smuggling, delivering cargo, or completing mercenary bounty runs, there’s always something to do in Rebel Galaxy. As the name implies, the game has a distinct mercenary spirit to it, evocative of popular movies and shows. 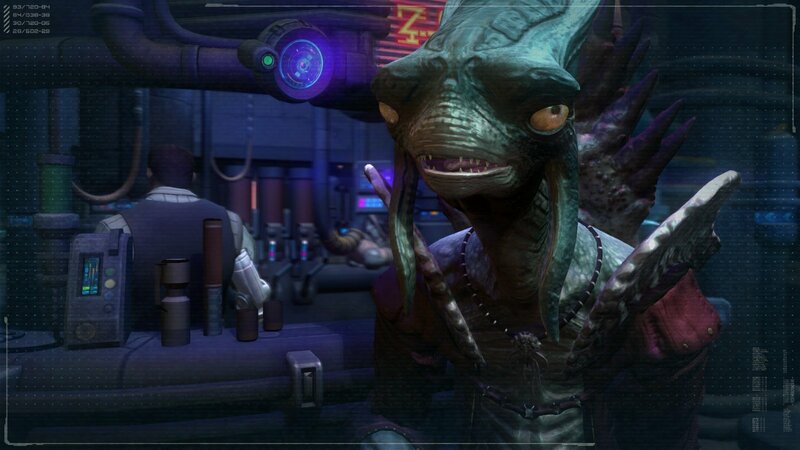 Players who recall the classic Star Control 2 will be right at home with the crazy cast of alien characters. Space stations hold an array of interactive lifeforms to talk to and how you choose to interact with them dictates how they treat you in return. You can also hail ships—even during combat—and talk to the captains. 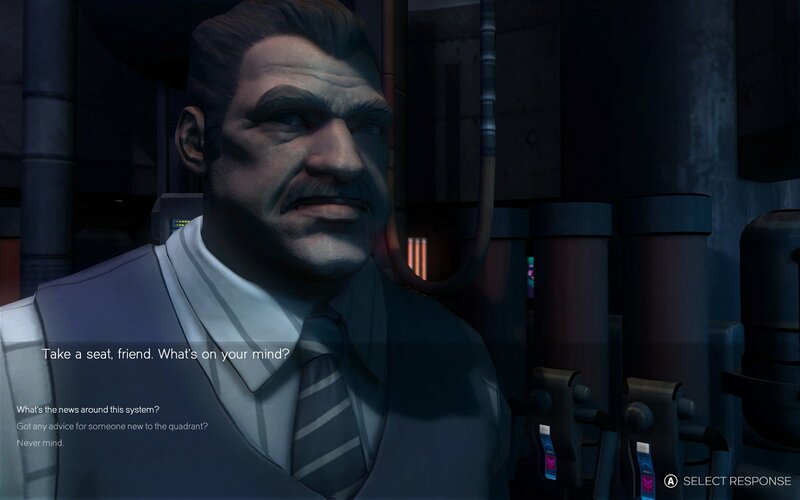 Dialogue is handled with a familiar dialogue tree, and certain responses can instantly lead to combat, while others to new and profitable opportunities. Another surprising influence is Assassin’s Creed: Black Flag. 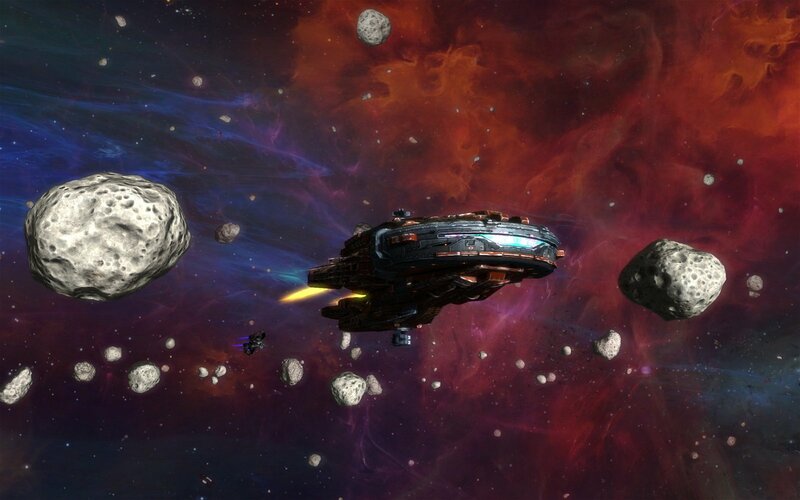 Unlike other space combat games, Rebel Galaxy takes directly after pirate ship-style combat. There’s no vertical controls to the space flight. 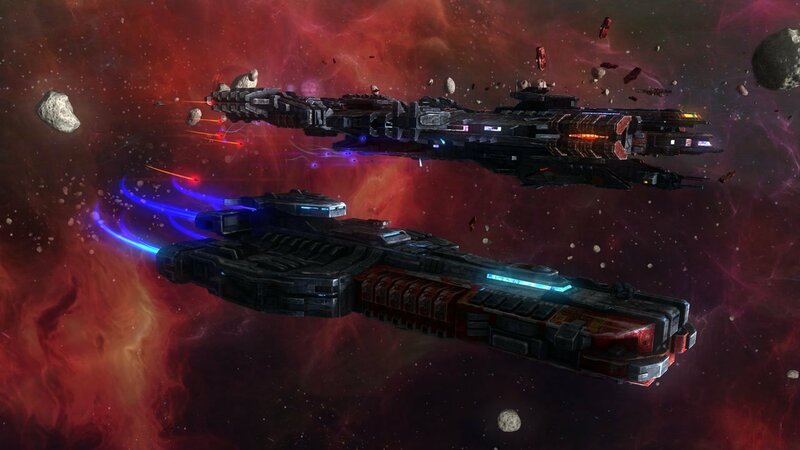 Instead, the game focuses on broadside combat to create a thrillingly unique take on deep space battles. It’s an odd choice, but one that Double Damage is very excited about. “The Black Flag-style ship battles were our solution to handle the size of our ships and the scope of our battles,” says Travis. “We think it’s easier to control multiple weapon systems and keep track of multiple enemies (some battles have you taking on 60 enemies at once!). It’s also a ton of fun, and the broadside weapons have a surprising feeling of heft that makes the combat incredibly satisfying. The more simplified controls also help make the game more accessible for those not as into the 360 degrees of motion most games of this sort rely on. Double Damage is surprisingly not going the crowd funding route to finish the game. They have instead chosen to finish the game outright and release it, which seems almost bizarrely novel in these modern times. Rebel Galaxy is already fun, distinct, and clearly on track to get even better. Double Damage is plowing ahead to get the game ready for its release on the PC, Xbox One, and PlayStation 4 later this year.